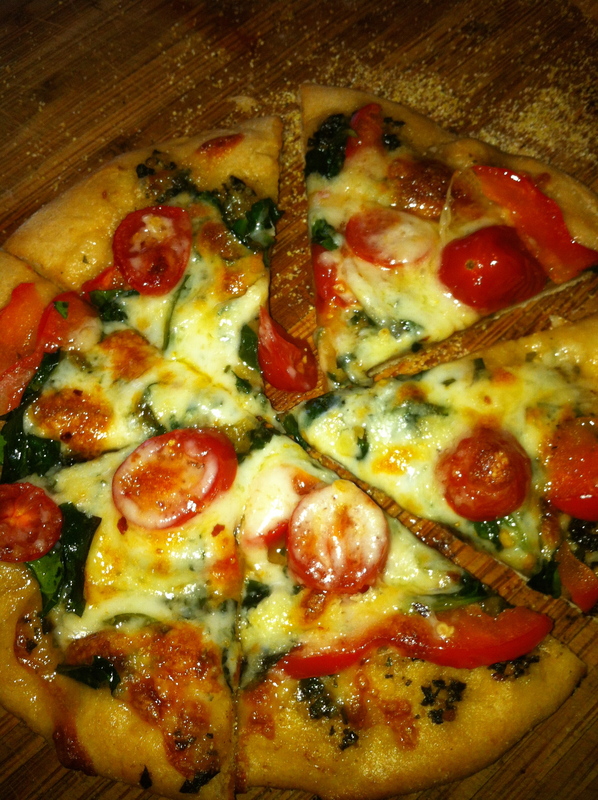 I’ve been promising the boys a Friday night of homemade pizzas all summer, but something always seemed to come up. Finally, this past Friday was clear (and it ended up being a bonus that Bill was also out of town for work — more on that later). Drop the yeast into the warm water and let it go to work for a few minutes. It should foam up a little bit. Stir the salt and olive oil into the yeast mixture. Remove the ball from the food processor and knead into a smooth ball. Pour a very little olive oil into a large bowl. Roll the ball around in the oil, then cover the bowl with plastic wrap. 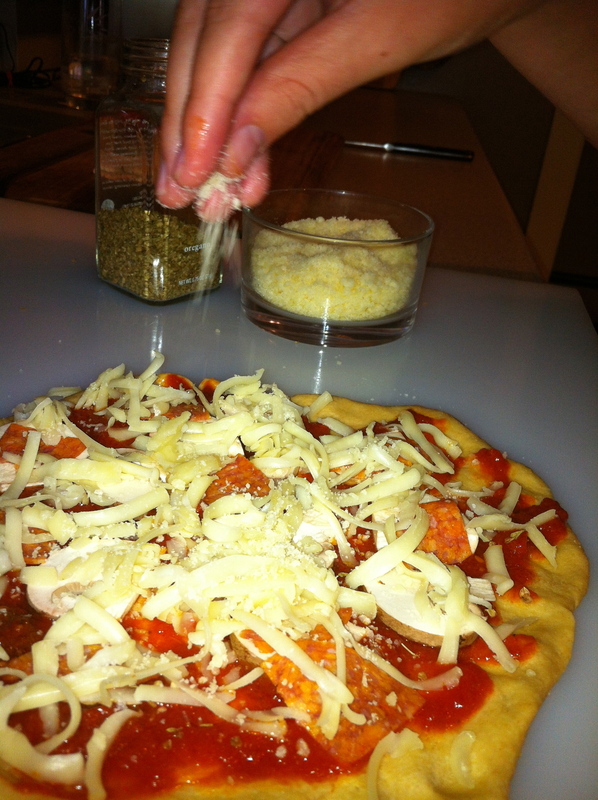 We had a blast topping our pizzas. The boys stuck with traditional “gravy”, mushrooms, and cheese. I used pesto (hey! 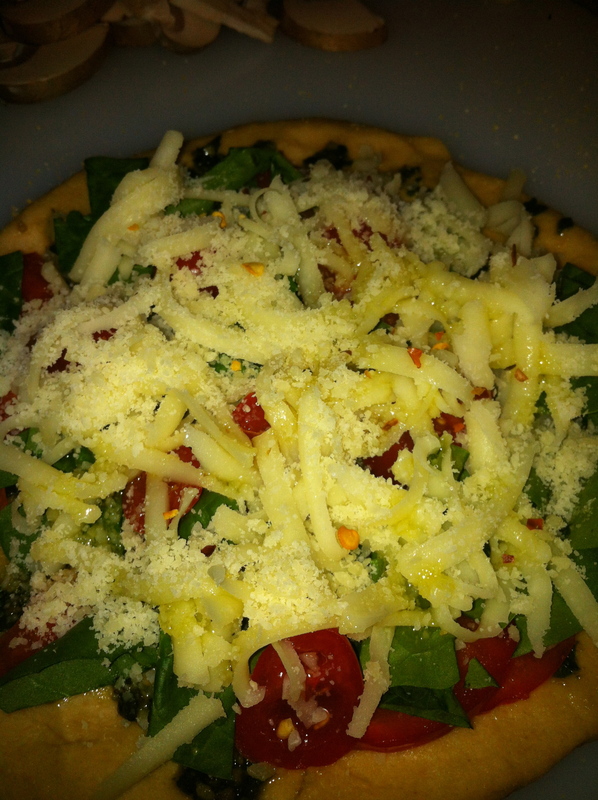 visit realfoodfor5 on Facebook and “like” it, if you haven’t already), veggies, and cheese. And why was it a good thing that Bill was out of town? Because running the oven at 500 degrees on a mid-August evening …. Not cool. I’ll be saving future pizza practicing for Fall. Unless …. I attempt that pizza grilling technique I keep reading about…? Hmmmm. I’ll keep you posted. 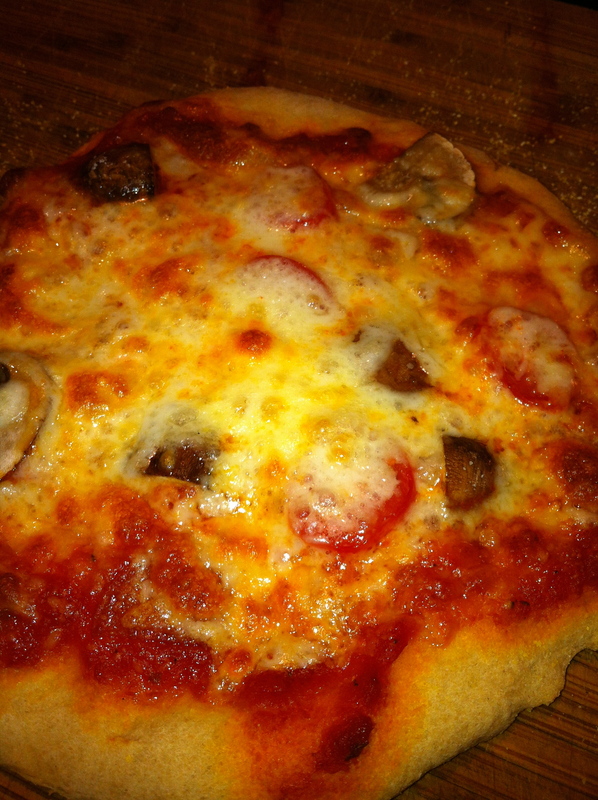 Those look great, my kids love to make their own pizzas. But I have a question, did you find that the dough cooked all the way through? Mine was still soft but the top ingredients were cooked. I don’t have a pizza stone so that may be the difference. . Just curious if I should cook the crust itself for a few minutes before topping it. Thanks!! I did think the crust was too thick the first time I made them. So now use a smaller ball of dough and make it very thin. I haven’t tried cooking the dough first — that sounds like a good idea! Though, I’d worry that the bottom of the crust might burn on a second cooking — maybe just use the broiler to melt the cheese and heat toppings? Let me know how it goes!